Despite a rise in the popularity of Kindles, Nooks, and other e-readers, Bookplate Ink has had a good year. 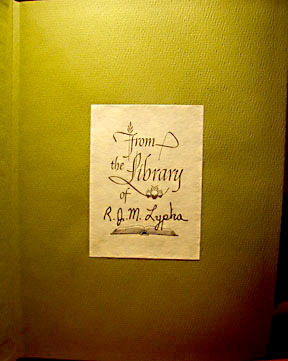 From my vantage point, many people still prefer reading physical books to digital ones, and many people enjoy personalizing their library with bookplates. As in previous years, the holiday season was a busy time for us. I noticed that many of our holiday gift orders were going overseas. We are shipping bookplates to a wider and wider audience around the world. This year, outside of the U.S., our largest number of orders was from Australia. Which, of course, gives me the impression that Aussies are book lovers! Canada was second, followed closely by the United Kingdom. Other European countries included France, Spain and Belgium. Colder countries in Europe with bookplate customers are Denmark, Sweden and the Netherlands. Of course, customers in warmer climates around the world ordered bookplates also: Malasia, Saudi Arabia, Chile, Singapore, Thailand, and Mexico and Brazil. Countries we shipped to for the first time this year include Slovenia and the Czech Republic. Other than filling out customs forms, I enjoy shipping overseas. I like to picture the setting in the country where the bookplates are going. On Christmas Eve and Christmas Day, it’s fun to imagine people around the world opening much anticipated presents and finding a box of bookplates printed with their name. And I often receive post-holiday e-mails telling me how much recipients love their bookplates! To all our customers and bookplate lovers, Happy New Year! May 2012 be a joyous and prosperous year for you. I started this blog with an entry stating that very often, people I meet don’t know what bookplates are. And this is true. However, my friends have also popped up with Antioch bookplates they have used, sometimes for years. When we first launched our Facebook page, a friend of mine from high school (many moons ago) posted this photo on our page of a book of his from years ago, with design B213 inside. This bookplate, by famous calligrapher Raymond DaBoll, was introduced by the Antioch Company in the mid 1960s, just a decade before we were in high school, and has been a bestseller ever since. 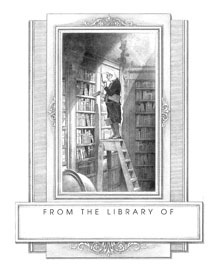 This bookplate would have been printed by the Antioch Company when they were still printing non-personalized bookplates to be available in retail stores. We print a personalized and non-personalized version of this design. A neighbor, after hearing about Bookplate Ink, looked through his library of books that had belonged to his grandmother. 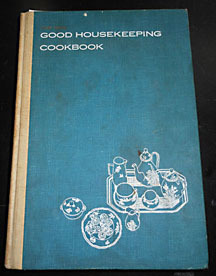 In the classic “Good Housekeeping” cookbook, her favorite which he says she used every day, he found an old Antioch bookplate which we are still printing as design M777. This design was introduced by the Antioch Company in the 1950s. As an early Christmas present, this week I gave him a box of bookplates with this same design, but personalized with his name. The look on his face when he opened the box was priceless to me. He was so happy to have this connection to his grandmother. And then there’s me. When I was thirteen, my mother gave me a box of non-personalized bookplates, design B208, for Christmas. One of our most popular designs, this adaptation of German Romanticist painter/poet Carl Spitzweg’s famous satirical painting “The Bookworm” was originally published by the Etchcraft Company. 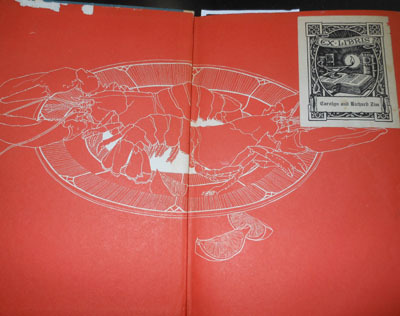 It was introduced by the Antioch Bookplate Company in the 1950s. When I moved to Yellow Springs, Ohio, and started working with bookplates in 1990, I was amazed to see this design and realize I had come full circle. Merry Christmas and Happy Chanukah to all our readers and customers! This time of year is very busy at Bookplate Ink. We receive many, many orders for bookplates to be given as Christmas gifts. Amidst all the Christmas craziness, many customers take the time to write wonderful e-mails and comments in their orders. I’m convinced that bookplate owners are some of the sweetest people in the world. This is the type of comment that makes everything else worthwhile. When I picture Auban’s mother finding that bookplate from a father she lost at such a young age, it brings tears to my eyes. I wrote to Auban that when I started printing bookplates, I had no idea that they would mean so much to so many people. Auban wrote back: “My younger sister passed away last year and I have found books of hers with the bookplates we got for Christmas one year. It has been such a tangible connection to family members we’ve lost recently and long ago.” More tears. I know many Kindles and Nooks will be given as Christmas presents this year. But nothing beats the beauty and intimacy of a physical book (especially with a bookplate inside!) as a present. I was very encouraged to read an article in the New York Times this past Sunday saying that publishers are adding high quality and decorative touches to book covers and endpapers to encourage the pleasure of owning physical books as opposed to e-books. As I know from this business, there are still plenty of people reading and enjoying real books in their personal library.